Audio connectors are simply the electrical connectors used for carrying the audio signal. Audio interfaces have certain physical parameters as well as interpretation of the signals, having the physical layer, data link layer, as well as partly the application layer. The physical characteristics of the electrical equipment include both types and numbers of the wires which are required, as well as voltages, optical intensity, frequencies and design of the connectors themselves. Any of the data link layers details can define the way some application data is encapsulated. The application layer details are used for defining the actual audio format which is being transmitted, incorporating such codecs as MPEG-2, PCM or the DTS Coherent Acoustics codec. Sometimes the application layer is left open and some of the types of connectors are used by different hardware interfaces, meaning that in some cases not all of the components which have physically compatible connectors can actually work together. Some of the mentioned connectors as well as other types of connectors are also used at the radio frequency for being able to connect a radio receiver to antenna. There is an analog to radio frequency connectors, which is an A/V connector – the one, known to be using the shielded cables for inhibiting the radio frequency interference as well as noise. For both simplicity and efficiency, the signal convention can be used by the storage medium and some of the playback devices can re-encode audio so that the format, which was originally used for storage, does not have to be identical to the one, which was transmitted over the A/V interface. Some of the connectors can carry both video as well as audio signals at the same time. The example of such devices can be HDMI combining the DVI-compliant uncompressed video data with uncompressed or compressed audio, as well as the one supporting other protocols. The so-called “FireWire” is the one used on Camcorders. 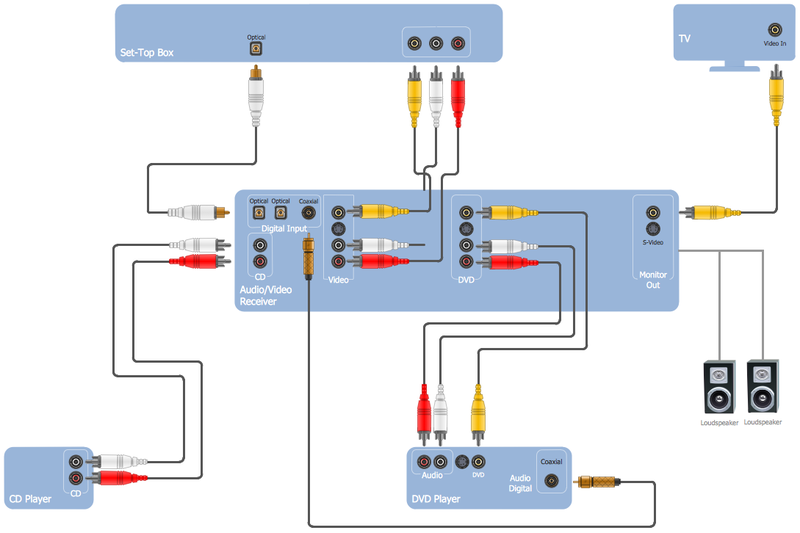 Another — Digital Media Port — is simply a connector, which was proposed by Sony on its video as well as audio products. The “DisplayPort” is well known for caring both digital video as well as audio and auxiliary information. Such device as “Mini DisplayPort” is known to be simply a smaller form factor of the display port, performing the very same function. 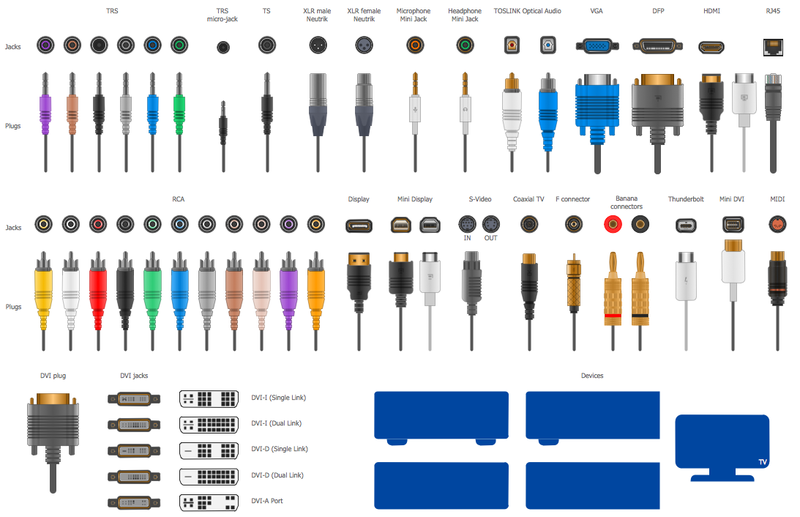 There are also Thunderbolt, Unified Display Interface, Mobile High-Definition Link, “F-connectors” (used with RF modulators), SCART (the most common in Europe nowadays), TRS phone connectors, which have more than only one ring, and Sony's hybrid RCA with a TRS pin. The Coaxial cable also has other names, such as RG-6, RG-59, Cable television, CATV, etc. The other composite connectors that carry audio, video, USB and power and their examples can be Apple Display Connector, Apple 30-pin dock connector used as a docking cradle for iPhone, iPad and Apple iPod, Portable Digital Media Interface, which is known to be including DisplayPort for digital audio and video, and USB-C, including DisplayPort, Thunderbolt, USB 3.1, superMHL, power and HDMI. Nowadays there is no difference in the signals transmitted over coaxial or optical S/PDIF connectors, as both of them can carry exactly the same information. Choosing one over the other depends mainly on the availability of the appropriate connectors on the particular equipment. It also always depends on the convenience and preference of the user. 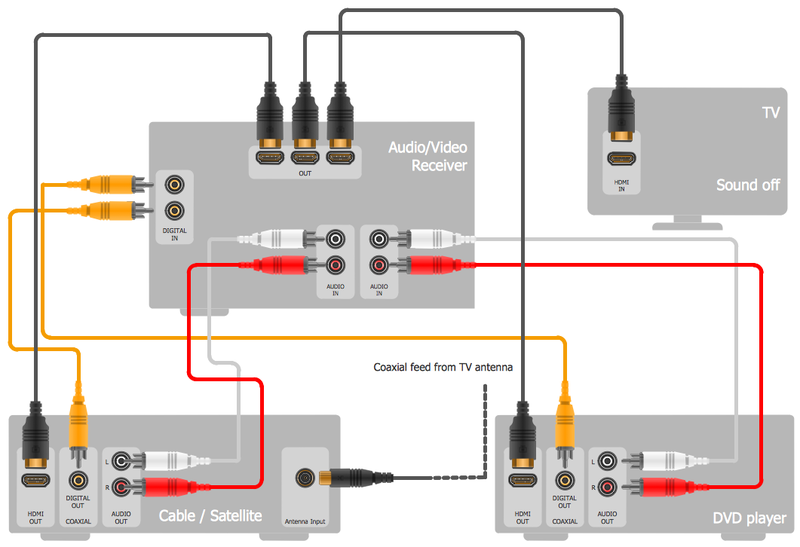 Connections, which are longer than 6 meters as well as those requiring the tight bends should use the so-called “coaxial cable” because the high light signal attenuation of TOSLINK cables can limit their effective range. The electrical connectors designed and used for audio frequencies and known to be called as the audio connectors can be either analog or digital. Most common audio connectors include single-conductor connectors, multi-conductor connectors, and digital audio interconnects as well as interfaces. Any electrical connector is known to be an electro-mechanical device, which is widely used for joining the electrical terminations as well as creating an electrical circuit. The electrical connectors are known to be consisting of plugs as well as jacks, allowing the connection to be temporary or serving as a permanent electrical joint between two different devices. Any adapter can be used for bringing together the dissimilar connectors in an effective way. Hundreds of different types of electrical connectors are known to be manufactured for signal, power and control applications. The connectors are known to be able to join two lengths of the flexible copper cable or to connect such cable to some electrical terminal. In computing, any electrical connector can also be called as a physical interface and any ConceptDraw DIAGRAM user can represent the connections within the scheme of the electrical circuit with the help of Audio and Video Connectors Solution, available for being downloaded from ConceptDraw STORE application as the one developed especially for the purpose of enabling all the ConceptDraw DIAGRAM users to create their professionally looking schematics quickly and much simpler than doing it all from a scratch. Audio and Video Connectors Solution offers the Audio and Video Connectors library with wide variety of predesigned objects of audio connectors and video connectors. All these objects are vector, so they can be used as is or resized without loss a quality. Audio and Video Connectors Solution includes also variety of ready samples which can be used as examples or as the base for your own drawings and schemes. Having the already created design elements is always much simpler rather than to make those symbols yourself from a scratch, spending lots of time on doing what was already done by the specialists of CS Odessa in order to help all ConceptDraw DIAGRAM users with their work of creating the needed schematics and diagrams. 88 vector shapes from the stencil library from the mentioned solution can all be used by any ConceptDraw DIAGRAM user so it helps make the audio or video related diagram within only a few minutes, up to an hour. Having the pre-design tools such as the mentioned design elements and symbols as well as the pre-made templates of the audio and video related diagrams can simplify the work of making similar drawings by editing the existing ones and so adding the needed symbols.